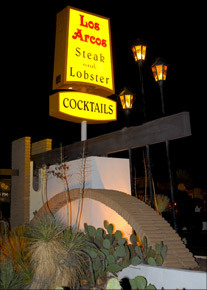 For four decades, Los Arcos has built a reputation as a friendly watering hole in the Elephant Butte Recreation Area and a favorite stop between El Paso and Albuquerque. You’ll find great food and attentive service in a warm, comfortable atmosphere. Legendary menu selections include our own high-grade, hand-cut steaks, prime rib, lobster, fresh seafood, and chicken. We offer an extensive wine list, and you can also enjoy our comfortable bar with outdoor patio. We have ample parking and banquet room.